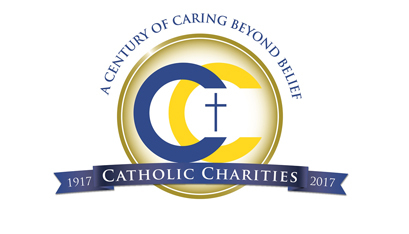 Catholic Charities in the Diocese of Albany is celebrating its 100th anniversary this year. Throughout its entire existence, providing food for the hungry has been one of the pillars of its Gospel-inspired mission. Food clearly plays an important role in the Christian narrative. Just one look at the Gospels tells us that. Accounts of the multiplication of the loaves and fishes or the wedding feast at Cana are the obvious examples; but, if we dig deeper, we see subtler, but still significant signs: the words of Jesus to Peter, "Feed my sheep;" and the way the disciples recognized Jesus after His resurrection, in the breaking of the bread. Of course, the Eucharist itself is the greatest reminder of the importance and necessity of food and nourishment, both physical and spiritual, in our daily lives. Christians, since the time of the Apostles, have understood that sharing God's love means putting faith into action and making sure those who are hungry receive food. Back in the early Church, when communities were smaller, it was easy to see who was in need and who had enough. Today, it can be more difficult. Many people who are struggling financially, or who do not have enough food, can be hidden from the public eye. Yet, they are our neighbors: seniors, working parents and children who live in different types of communities. Here in the Diocese of Albany, Catholic Charities and other groups, like parish food pantries, are on the front lines to help our brothers and sisters who are struggling with hunger. The winter months can be some of the most difficult, as energy bills strain already stretched budgets. That is one of the reasons why Catholic dioceses throughout the state of New York established "Feeding Our Neighbors" several years ago. Donations through this program help feed the hungry here in our own Diocese and are put to use right away. Feeding our Neighbors is a program to raise awareness of hunger issues and collect funds to provide food to those in need. Through partnerships with the Northeast Regional Food Bank and The Food Pantries of the Capital District, Catholic Charities can purchase up to 10 times what an individual could buy in a grocery store with the same dollar. That makes each donation much more powerful. Every dollar donated enables Catholic Charities to purchase more than six pounds of food at the Food Bank, and $1.39 pays for a meal at a soup kitchen. Catholic Charities can feed a family of four for one week with only $38.92. It's amazing what can be done with a modest amount! It is astonishing to realize that more than 168,000 people in our Diocese live below the poverty line -- and of those, upwards of 24 percent are children in the city of Albany. 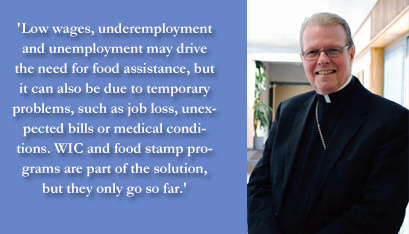 Low wages, underemployment and unemployment may drive the need for food assistance, but it can also be due to temporary problems, such as job loss, unexpected bills or medical conditions. WIC and food stamp programs are part of the solution, but they only go so far. Last year, more than 34,000 people sought help from food programs of Catholic Charities of the Diocese of Albany, and food pantries throughout our area are seeing steady traffic. The need and urgency are clear and present. You and I know there are many worthy programs and needs out there, and the people of our Diocese give generously when called upon. Feeding Our Neighbors is timely opportunity to help people in our area who are in need now, and to show compassion to those who are suffering in silence. You may never know exactly who was helped by your donation, but I can tell you that, when food items are on the shelf at a local pantry and someone comes in needing something for dinner, your gift is what makes all the difference.